Toast to life and love with this stunning set of Elegant Butterfly Toasting Flutes. The graceful design will be the highlight of your head table. 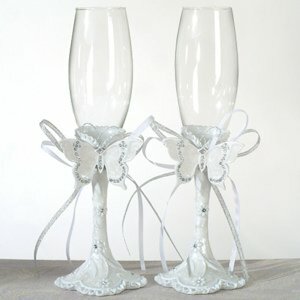 Each glass flute features a resin base accented with a charming white epoxy butterfly highlighted with perfectly placed shimmering crystals. We package the set of 2 in a lovely display box for years of enjoyment. Flutes measure approximately 10" high.